I haven’t posted for a few days because of schedule conflicts, along with Internet issues. 🙂 Enjoyed preaching at PBC of Monterey Park last night and will be preaching this evening for PBC of Long Beach. 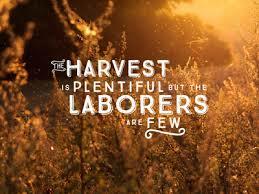 Missions’ Revival doesn’t officially begin until next week, but Pacific Baptist Church of Long Beach will be watching the video called, “The Harvest” tonight (a favorite of Pastor Joe’s), and immediately afterwards, I will preach a short message from John 4:31-38. One of the keys to getting laborers to the fields, especially the most neglected fields of the world, is to get them to “lift up their eyes” and to “look.” Lifting up our eyes and taking them off of the comfort and conveniences of this life, especially in prosperous America. But we must not stop there! We must be willing to take a “look,” a good “look,” at the great needs that are in our world today. Both physical and spiritual needs of course! While Wesley, in the words above, was primarily referring to our neglect of the physically impoverished, the same surely could be said of our neglect of those who are spiritually impoverished. The great harvest fields of the world! It’s high time for us to “Lift up our eyes.” It’s time for us to take our eyes off our own cares and concerns, our comforts and conveniences, and take a “look,” a really good look, upon the great needs throughout the world, beginning right next door! Just taking a few moments to reflect on the red letters of Jesus!! !